The Museum of Marrakech is an art museum located in the medina that holds exhibits of both modern and traditional Moroccan art. The museum is housed in the Dar Menebhi Palace, which was constructed at the end of the 19th century and renovated in 1997 by the Omar Benjelloun Foundation. Omar Benjelloun was a Moroccan journalist, engineer, lawyer and trade union activist. 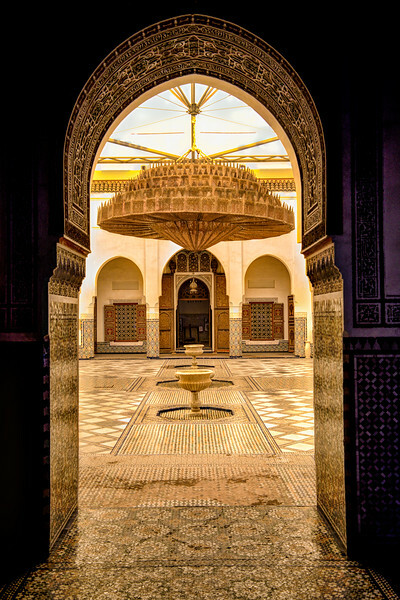 The building is an example of classical Moorish architecture, with fountains in the central courtyard, traditional seating areas, a hammam and intricate tilework and carvings. The museum’s large atrium was originally a courtyard and is now covered in glass, tile and fabric. The image here is of the huge, centrally draped chandelier-like ceiling piece consisting of metal plates decorated with geometric and epigraphic cuttings.